Congrats to Irvin Chen (@irvin) for being the Rep of the month. Thank you for all your hard work! Read more on discourse. Big thank you to all mozillians present at FOSDEM this last weekend helping at the booth, in the devroom or having a talk! Congrats to awesome former rep Benny Chandra for helping the Jakarta Post, Indonesia's leading daily English language newspaper, to launch their official app for Firefox OS. Thank you Benny! Thank you to Gio for lending a hand in triaging Get Involved inquiries for Marketplace. Because of Gio, interested contributors are getting responses much quicker! Add-ons has surpassed 4 billion downloads (4,082,661,992 as of this morning)! 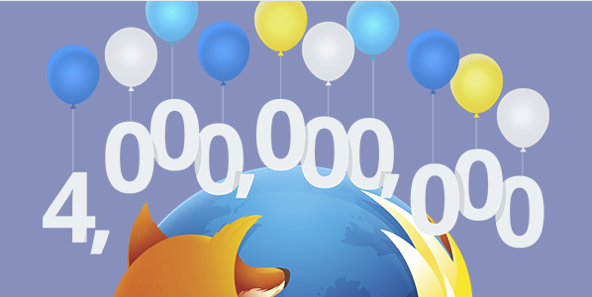 Cheers to all of the developers who have contributed their time and talent to making Firefox the most customizable browser available, and to the millions of people using it. JFokus Developers Conference from Feb 2nd-4th in Stockholm, Sweden. Florian Scholz speaking on the needs of the modern web: The modern web needs a better programming language and at the same time, there is no way the current one could break existing code on the web. The Forward 2 Web Technology Summit workshops are Tues Feb 3 + Thurs Feb 5 with the main conference happening on Wed Feb 4. Mozilla SF is hosting a workshop on Tues & Thurs, an all-day "deep dive into JS Fundamentals" taught by Bianca Gandolfo and teaching assistants. If you're interested in attending the conference and workshop, register at http://forwardjs.com using discount code mozillian-js-fundamentals. This is good for 5 tickets. Make sure you select the "Sessions + 2 day training" ticket and then select "Bianca Gandolfo 2 Day - JS Fundamentals: Objects, Arrays, Functions & Intro to Functional JS" for the class during checkout. If you're interested in attending only the conference, register using discount code mozillian-forward. This is good for 5 tickets as well. Finally, if you miss out on the free 5 tix, you can still get $40 off by using the code "Mozilla-40" when you register. MCE started as a conference for developers by developers. This year, we are expanding our horizons to include all mobile creators - developers, designers and tech leaders. We are interested in details, hidden mechanisms, in short - everything behind the scenes that makes the user go WOW! when they download an app. The U.S. Federal Communications Commission (FCC) is expected to take a critical vote on net neutrality rules on February 26th. The outcome will have global implications, and could change the nature of the Web. Mozilla has been actively working on this issue for nearly a year, and beginning Feb 5th Mozilla is launching an urgent campaign to connect US citizens with their elected officials before the big FCC vote. Every voice counts, stay tuned for more about this campaign, and announcements in future project calls. We've been working on new features and ideas for FirefoxOS - thanks for those who participated! Our Brown Bag, "How Advertising Works (from Content Services)" is tentatively scheduled for Weds Feb 11 at 10am ET on Air.Mozilla. We will give a short presentation and have Q&A with attendees. The session will be recorded, and we may do a follow-up brown bag if there is enough demand. This page was last modified on 2 February 2015, at 19:15.